You can mark a job as paid in Housecall Pro without sending a payment over to Quickbooks Online. Scroll down to the bottom of the job details page to the QuickBooks Online box. Click the 3 dots in the top right corner. You'll have the ability to mark the job as paid with Cash, Check or Other. You can also choose to notify the customer and send a payment receipt from Housecall. 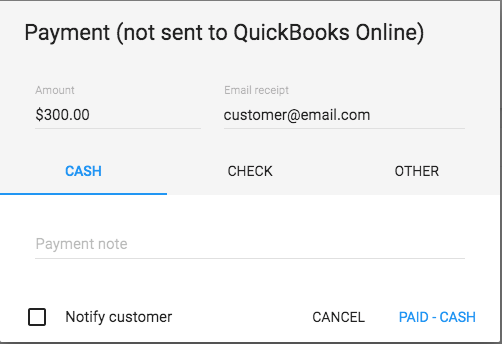 Once this is done, your job will be marked paid in Housecall Pro, but we will not update payment status in QuickBooks Online.